Many of you have bikes or parts to donate but don’t live near our shop on NE Alberta. Is there an REI location closer to your home? Then you’re in luck! 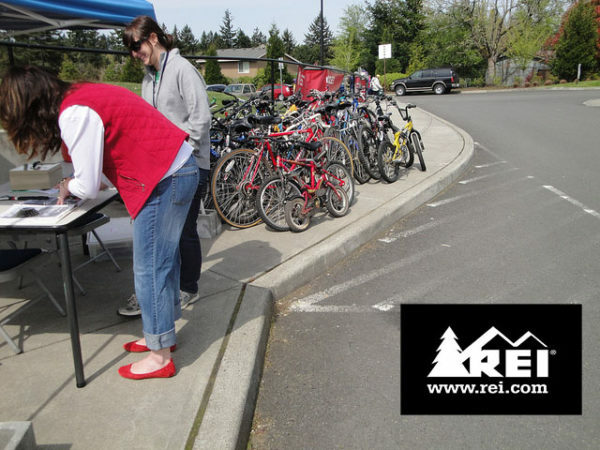 On Saturday, October 6th, from 10am to 3pm, Cycling Center volunteers will be collecting donated bikes and parts at the REI locations in Tualatin, Beaverton, Hillsboro, and downtown Portland. And if you have any shopping to do, REI gives all donors a coupon for a discount on your shopping adventures. Our usual suggested donation of $5 per bike still applies, to cover the cost of processing donations and paying staff to disassemble and recycle the bikes that aren’t salvageable, but as always, that’s completely optional. As with all our bike donations, these bikes will have a varied future. Kids’ bikes will most likely be refurbished and donated to kids from families with low incomes; adult bikes may be used in our various programs or may be fixed up for sale in our shop. Those donations keep our shop and our programs going – so thank you in advance! Questions? Contact jim.milne@communitycyclingcenter.org.